Service providers in the Intervenor Services sector first assembled in 2002 to discuss a “path to the future” that would address the pressures the sector was facing in the areas of human resources, financial availability and service gaps. 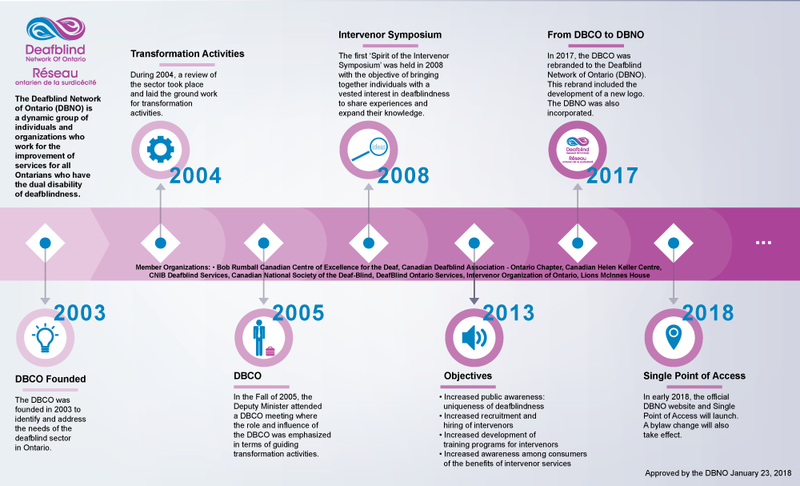 In 2003, the Deafblind Coalition of Ontario was established as a formal group to identify and address the needs of the sector in Ontario. In 2017-2018, the group underwent a re-branding and name change to the Deafblind Network of Ontario. This name change also saw the re-design of the logo and website, which incorporates the single point of access for Intervenor Services in Ontario.